Past studies have shown that children whose parents have chronic pain are at risk for having pain and mental health problems themselves. So far, research has not shown what predicts which of these children will have these problems. This study aimed to find out which characteristics of parents and children (e.g., personality characteristics, chronic pain information) predict which children will be at risk for these problems and what helps children avoid these problems. 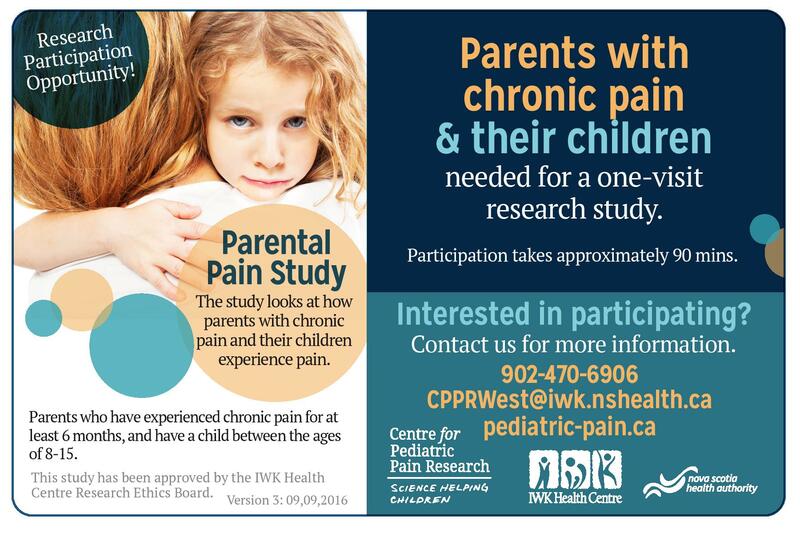 The study involved a parent with chronic pain and one of their children (ages 8-15 years) coming to our research centre to fill out some questionnaires and participate in a cold water activity. CTV News Atlantic visited our lab for a segment about Kristen's research project and also featured Karen Smith, a patient advocate for chronic pain. Click here to watch CTV's Housecall! How does parents’ chronic pain affect their children?